*Discount reflected in Sale Price. Cannot be combined with any other promotions. See freight details and exclusions below. These classic, premium files are made of heavy gauge steel with welded wrap-around steel construction for stacking strength. Files are modular so they can be used individually or they may be stacked up to (5) files high on a 6" Closed Base for high-density filing in a small amount of space. The 5-drawer file allows you the versatility of storing up to 500 sheets per unit active filing, 750 sheets of semi-active or 1000 sheets of inactive material. Each drawer is 2-1/8" deep. Ideal for a high traffic project storage area, the 10-drawer file allows easy access and retrieval of materials. All drawers feature a 4" adjustable and fully retractable Document Depressor to keep documents flat in drawers. The Closed Base raises files 6" off the floor for protection and easier access. Front is recessed 2-3/4" from the file for toe space. 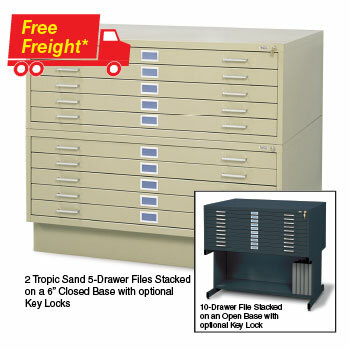 Closed Base can hold up to (5) files consisting of any combination of 5 and 10-drawer cabinets. The High Base raises the file 20" off the floor. Base has enclosed back and sides with an open front for extra storage space. Sturdy all-steel construction holds up to (2) files. Museum/archival quality paint finish ensures there is no acidity or alkalinity created in the files by the finish that might damage your documents. Flat Files are available in your choice of (4) Standard Colors (Black, Gray, Tropic Sand & White) or 16 Custom Colors at no extra charge! Custom color files are not returnable unless defective. *Free ground shipping with commercial dock delivery within the Continental United States. Additional trucking charges for residential delivery, inside delivery, or lift-gate services may be applicable. Freight service paperwork will be emailed or faxed - customer signature is required before order can ship. Bases also ship free when ordered with a Flat File.